On the eve of the finals, John Van’t Schip has made the surprising decision to switch to a 4-4-2 diamond formation. While he has used a 4-3-3 throughout most of the season, however, he has changed shape in the past to counter a specific opponent. As Kate Cohen detailed for The Guardian, he did so against Adelaide United earlier this year, changing to an unusual 3-4-3. Against Wellington Phoenix, the formation was simpler – a 4-4-2 diamond with Josh Kennedy and Harry Novillo upfront, supported by a narrow four-man midfield. The intent, presumably, was to match up against Wellington’s own diamond formation, with the result being that City were able to numerically match up against the Phoenix’s midfield. On paper, this was logical, as Ernie Merrick’s team play narrow when in possession, and look to construct attacking moves down the middle of the pitch. City were able to congest this midfield zone and make it difficult for Wellington’s key attacking players to find space. Roly Bonevacia, in particular, was marked tightly by Erik Paartalu. Problems arose, however, when Wellington were able to expose City’s lack of natural width. The absence of wingers in a diamond formation means the opposition full-backs have no direct opponent. As a result, both Manny Muscat and Louis Fenton were able to advance forward and receive passes in space throughout the game. This meant Wellington always had an ‘out-ball’ when in possession and often looked to spread the play wide towards their full-backs. The chalkboards above show a high number of passes towards the full-backs originating from the centre circle. This illustrates how City’s focus on congesting the circle left the wide areas free, with Wellington happy to knock passes out towards their ‘free’ player on the flank. This sequence is indicative of the wider pattern – you can see in the GIF below how much time Fenton has to take his first touch forward into space. Two more examples of City’s weakness in wide areas are illustrated in the video below, including the penalty. Fenton’s influence on the game is obvious: he won the penalty and created a number of good opportunities. It’s hardly surprising, either – his forward runs from right-back were decisive earlier this season against the Western Sydney Wanderers. While City were able to make it difficult for Wellington to play forward in midfield, they did so at a price. The fact Fenton contributed as much as he did (remembering that it was only because of Nathan Burns’ disastrously bad penalty that he didn’t have an assist) suggests that City’s diamond formation may have done more harm than good. Nevertheless, Van’t Schip continued with the formation the following week against Perth Glory, perhaps encouraged by the number of chances they created against Wellington. In terms of the formation battle, certainly, here there was no need to clog midfield, as the Glory have recently switched to a flat 4-4-2 formation. In an open, entertaining game with an extraordinary amount of shots, this contributed to City’s ability to create chances. With a four-man midfield outnumbering Perth’s two-man midfield easily, City were able to get players like Mooy and David Williams between the lines. Furthermore, Novillo and Williams, the two strikers, drifted wide and collected passes on the run, driving powerfully towards goal. In this sense, the diamond worked well. Again, however, it allowed the opposition full-backs to run free. 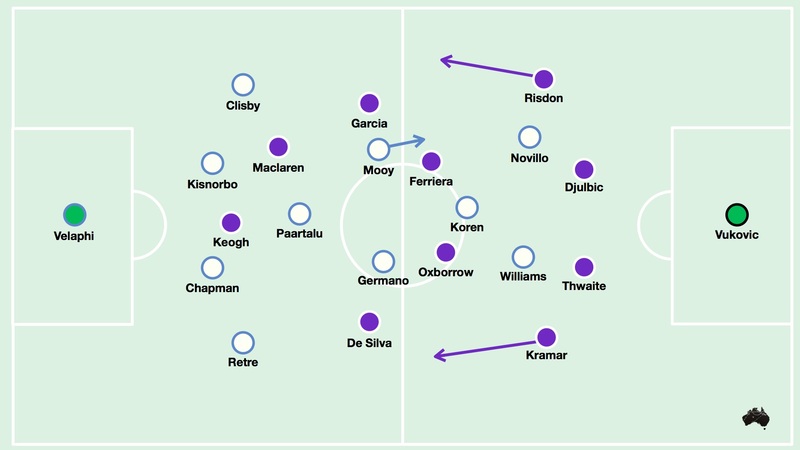 The narrowness of the diamond midfield when defending meant both Josh Risdon and Denis Kramar were able to move forward when Perth had possession, as they had no direct opponent. With the exception of Mooy, Kramar received and completed more passes than any other player in the game. Perth’s best attacking chances came as a result of this. Early on, for example, Risdon received a pass in space, drove forward and played a clever through ball in behind for Garcia, whose shot hit the post. Later, Risdon got forward to attempt a wonderfully curled shot saved spectacularly by Velaphi, as well as delivering a cross for Keogh that was converted, but ruled out [correctly] for offside. However, Kramar contributed to the game’s key moments. He drew a foul from City right-back Retre – who had been drawn upfield because Kramar had no direct opponent when receiving a switch of play – which was his second yellow (amazingly, the first had come just seconds earlier). The red card handed the initiative to Perth, who continued to take advantage of the space down the flanks – exaggerated by the fact that Van’t Schip switched to a 4-3-2 formation, meaning there was still no direct opponent for the full-backs out wide. They continued to get forward, with Kramar crossing dangerously on a number of occasions. Eventually, Maclaren scored the breakthrough goals. The diamond formation has had positives and negatives. It prevented Wellington Phoenix from dominating the midfield zone as they normally do, and it created an overload between the lines against Perth Glory that meant City were able to create a number of chances. In both games, however, it has allowed opposition full-backs to run free. This is not an issue in itself, however, Fenton, Risdon and Kramar have all contributed dangerous moments with their freedom on the ball – the most notable of which include winning a penalty and drawing a red card. A simple cost-benefit analysis would suggest that the diamond is causing more problems than it is solving for City. It will be interesting to see if they continue with it against Adelaide (incidentally, they appear set to play them in the final round of the season, and then again in the finals series). Gombau encourages his full-backs to play high up the pitch, which is proving to be a worthwhile tactic against City’s narrow midfield. Thanks for the analysis. Of course the nominal formation is important but how the formation is used and the latitude provided to players is also important. This of course raises an issue that you alluded to without specifically discussing, the role of City\’s full backs. They spent most of both games sitting deep inviting the opposition full backs to run onto them. Of course the other issue in both games is the usual Heart/City issue of poor shot conversion. You could argue in terms of shots created in both games that the midfield diamond is working well for City, however there are no points awarded for shots created. City\’s forwards between them have had an (usual) appealing season and surely someone who can finish properly will be a major off season recruitment strategy if JVS or a new coach continues to ignore Josh Kennedy\’s strengths and continue to provide him with poor service. I meant \’an appalling season\’ not \’appealing\’!